In a recent debate with a couple of other passionate individuals, it has been said that this country was founded on Christianity. I’ve never been a fan of history; after all, he who conquers writes it. So can the few sources we do have really be trusted? And maybe we will never know the truth behind the premise with which our country was founded. There is enough, however, evidence for all sides to fuel whichever campaign they so choose that both the religious and the non-religious alike can argue til their blue in the face. But I find it fascinating that in a world so full of betrayal and deceit that we can not, for just a moment, wrap our minds around the idea that maybe things weren’t so “cushy” back then either. Let me explain. So see, even our precious pledge has been altered to suit our current agenda. People feel passionately about their beliefs, and that’s good. But we all need to realize that not everyone shares those beliefs. Is it so hard to just let others believe and feel the way they do about a topic, in this case religion? Why must we push our ideals on others and claim it to be the only way? This, my friends, is the very reason religion belongs no where near government. You force our beliefs: You instantly destroy what progress has been made over the past 200 or so years. Posted on May 12, 2011, in Atheism, Lifestyle, Philosophy, Politics, Theism, World. Bookmark the permalink. 33 Comments. With all due respect, are you not trying to force your atheist beliefs on us? I understand your passion. But why can’t you be content in your atheist philosophy and not try to force it on others. You must admit that your view is a minority view. That is true. I am more than willing to share my distaste for religion as a whole, Christians and Muslims alike. And while I do agree that that atheist community is rather small in comparison to it’s Christian couterpart; but you can’t refute the fact that the scale is slowly tipping towards freethinking. Whether that be in the form of atheism, agnosticism or other forms of belief systems other than theistic ones. People need educated. I stand by my philosophy that if your parents were Christian, then chances are, you will as well. I want people thinking for themselves. And, at the end of the day, if they choose Christianity, then that’s fine. But I don’t feel that this is the truth today. I think the majority of folks really do not care one way or the other. They are more concerned with being a good person. But, due to their upbringing, they call themselves Christian. These folks are not completely represented clearly in these polls that Christians conduct to make their numbers look better than they actually are. So it might seem that I am spilling my beliefs onto others, when in fact I am begging those same people to question their belief systems and ask how that applies to the person they are today and, more importantly, who you want to be tomorrow. I have no problem with you expressing your view and encouraging others to question theirs. If you can gain converts then more power to you. 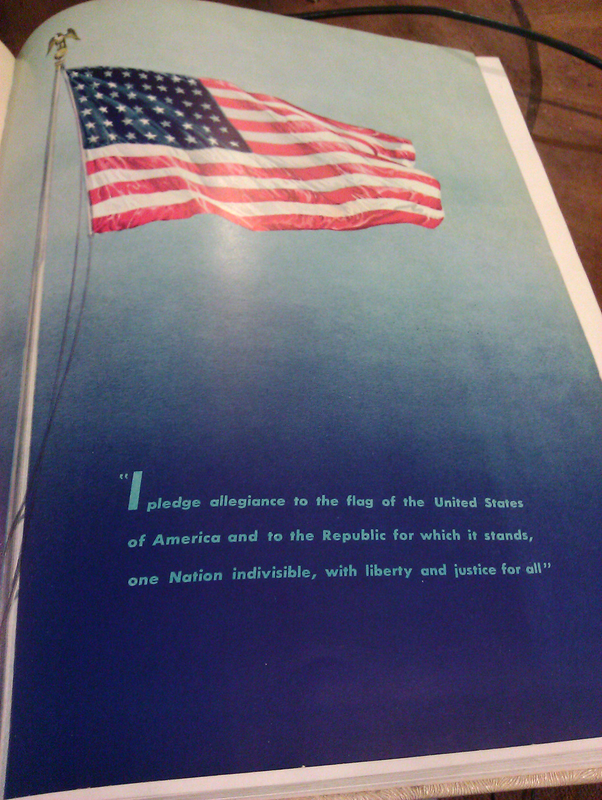 Any comments about the Pledge of Allegiance and how it was altered to suit the time’s agenda during the 50’s. Well, I have no problem with it. We have reference to God on our money for example. We have people swear in court so help me God. I am sure that this galls you as an atheist but it is the majority and in a democracy, majority rules. We’ll take your Christians; we don’t want the Muslims, however. I think those people are doomed from birth. Yes, that does bother me. Along with many other non-Christians. And in a secular society, where does this have any bearing? We need to restructure our system to accomodate the whole. I’m not saying that we should alter our personal beliefs; I’m saying that we should create a system that works effectively with all “personal” belief systems. This has always baffled me. It wasn’t Francis Scott Key who initiated it, it was Francis Bellamy. But otherwise, you’re right about the history. But I have this to say: If we are to silence our speech everytime someone might be offended by what we say, it would be a mighty quiet country. Just like I tolerate anti-Catholic bigotry, Lyn, you and your admittedly small group of atheists should not change it this way. You can, at your own discretion, not say “under God”, if you choose not to. Yes, some might point and judge, but that’s their problem, not yours. Just stand tall for your beliefs. And you’re always welcome to ask for an exception in court. I’d tell them that the Bible means nothing to you, so an oath sworn on it would be empty words. And if you want to give me all that money with our motto on it, I’ll gladly take it off your hands. Money is mostly electronic these days anyway…but send it, please! I’m remodeling my kitchen and could use a few extra bux. By the way, I’ll defend your right not to say “Under God” any time. Thank you for that correction. I got my authors mixed up. Francis Scott Key was responsible for the National Anthem. I think what I’m saying is this: Let’s not attach ourselves to anything. You would be upset if they suddenly changed it to say, “…one nation, under Zeus…” right? Why is this offensive? Because it’s not what YOU believe. What was wrong with the original Pledge of Allegiance? It bound everyone together. The way it is today, it alienates anyone not Christian. And, considering this country is considered the “melting pot,” these actions should be considered noncausative. I think to be politically correct you need to amend your statement to radical muslims, but I would be happy to keep them all out personally. Not very PC of me either. I believe that it is possible to be ‘free thinking’ and a Christian too! Remember, when people check a box to define themselves, they are making a conscious decision. If there is an aethiest box, they would check that one if it best decribed them. People all take their spirituality in various stages of seriousness. But give them the credit to know what they are. Further, what is your source for your article? I would like to read it. I am with you on questioning yourself. In my early 20’s, I couldn’t bear that my beliefs were a simple result of parental training. So I allowed myself to break free and look around. Math is one of my favorite subjects. I have decided that it is mathematically more probable that there is an Intelliegence that created the universe than it resulting from a series of ‘accidents’. The result of my wanderings is that I have come back to God & Jesus stronger and more convinced than ever. I will write a blog about this topic which I would love it you read. I have no desire to convert you, by the way. Because if God is truly God, He sure doesn’t need little ol’ me to acheive His goals. It is a strictly personal journey. The United States is NOT a secular society, Lyn. It is vastly a Christian country. Add Muslims & Buddists & agnostics and you get an even higher pecentage of people that would consider themselves ‘religious’. The men who created our country as well as its inhabitants, were almost 100% religious. The insistance on separation of Church and State was to ensure that no church organization (specifically, the Catholic and Church of England) could dictate politics. This was in direct reaction to the religious purgings that had been happening in England, France & Spain. Political leaders, religious leaders, and poor smucks who didn’t know whether or not to kneel at the altar were systematically murdered for their religious beliefs. This does not, I repeat, does not mean that religious beliefs are not an essential part of politics. If you read the writings of the founding fathers, if your read the meaning of ‘created equal under GOD’- (ie, Because God created each of us equal- no king can have spiritual and thus, political soveignty over another man), you will see that they absolutely used theological thought in creating the Declaration of Independence, the Bill of Rights, the Constitution. Only in the last decade has the idea that separation of church and state means that religion is not allowed in political speech and expression. These rights, in fact, are expressly protected by our constitution no matter who you are (a politician or not) or where you are (work, play, school, etc.). There is no limit to these rights. A politician, a president, a teacher, a student- all have express rights to expressions of religious thought. I actually worry that people are so comfortable with these rights that they are not paying attention to the slow encroachment of legislation on these rights of free speech. Example: children are being prevented from praying at school!! You must at least stand up for free speech, Lyn. Someday, it might be YOUR speech & ideas that are being repressed in school or politics. I have no problem with Lyn speaking his mind. I have no problem with him being an atheist. What I have a problem with is that he wants to take God out of our soceiety. You have got to admit that Susan is quite the impressive wordsmith. I fancy myself a writer, but her thought processes and writing style put me to shame. Nope, not trying to remove your god. Thats yours. I can not take that away from you. However, I do not want to share your god; just like I do not care to share a smokers cigarette. Society is forcing us to second hand smoke 3 or 4 packs a day. Frankly, our clothes are starting to stink and our walls are turning yellow. Why can’t you just ignore any references to God. Really, no one is trying to force him on you. Belief is a matter of choice and I have no problem with your choice. I can, and I do. But can you agree that it swings in favor of Christianity? That the non-Christians are left “out of the loop” so to speak? I love this country for many reasons. I also love and respect my neighbors. I consider myself a good citizen, a good son, a good brother, etc. But at the end of the day, my beliefs are “poo-pooed”, or take a back seat due to a belief structure that does not belong in a government that supports ALL belief systems. I’m not saying that you should not be allowed have a god. I’m saying that it should, in a modern society like ours, wash the Christian notions from our minds. Put religion back in the homes of those who welcome it. Let the rest of us live the same lives as you. Allow us to stand proud, next to our Christian neighbors, and solute the same flag that our founding fathers gave so much to raise. Yes it does swing towards christianity and always will. We started that way and will continue to do so. Okay, so your argument is that because “most” of the people who live here are Christian, then our nation must be Christian? Using that same logic, Dayton Public Schools have more black people than any other race. Can we call those schools “Black Schools”? No, that would be absurd. Listen, you’re fine with things the way they are because things are comfortable for you. What if the shoes were on the other foot? Would you feel somehow left out? There’s plenty of room for people to practice whatever belief they want… privately. Is that fare? Egads, why do people assume God is some anthromorphic version of themselves? There isn’t one good reason to involve God in a pledge of national allegiance. Not one. I can think of many reasons to use God in the pledge. If you don’t want to pledge under God, that is your choice. I pledge daily to the Spirit of God and it has nothing to do with America; God is universal and ever-present. He is not an American, he is not a Russian, he is not an Australian. God has nothing to do with the nations, norms and mores of human society. The soul is free; and heaven is not divided by countries and nations it belongs to everyone. You miss the point, you are pledging allegiance to our country as one nation under God. It does not posit that we have a monopoly on God. Now I ask you, what was wrong with that? There’s nothing wrong with it. It encapsulated much more of population. It left no person standing alone wondering where they fit in, in our great nation. So if you are not under god, the line of why you are pledging seems pretty senseless now doesn’t it? “one nation under god,” doesn’t apply. So now the Pledge of Allegience is good only for those who believe in the Christian god. No other gods are welcome; and especially if you have none at all. This is bad ladies and gentlemen. Surely you can see this? Surely to god you step outside of your box for a few moments to see it from the point of view of those who either believe in a different god, or none at all, could alienate parts of OUR nation? The original Pledge was beautiful. It gathers more people together. The whole point of this great nation. Goodbye to oppression and goodbye to tyranny. We stand strong, together. All us us. I can sympathize with your point and see your reasoning. However this is a republic where majority rules. If we had to make adjustments for every belief system, we would be hamhanded and hog tied. I take it that you would approve it if we took God off of our money as well. How about taking an oath in court where the phrase: “so help me God” is stated? The constitution upholds the separation of church and state in order to protect the laws of society from the relative subjectivity of worshiping a higher power. When “God” gets mixed up with country people justify war and killing in the name of “God” for that country; which we do as well as the Islamic nations do. We are no different from them in this regard. Lyn, You’re right……again!! Most people never really chose their religion. I written a post about this called Geographic Righteousness. About 80% of the world(my guestimate) believes that salvation was birthed at the end of their block. We shouldn’t let out values be dictated by geography. But men need ego centered beliefs that reinforces their own insecurities. We are born as spiritual beings and then become Catholic, Methodist & Hindu, why because our Moms and Dads said so. Our community says so. Yes, worldofellema….you are right again. Why do men always think that God is like them? Oh, I already answered that question…..because their insecure!!! Is that what God is? Only slightly better versions of ourselves. My current post is a book review of “Your God is too Small,” a book that was published in 1952. We can abandon the old child’s ideas of God and embrace a greater understanding. Thanks. Well I was born catholic and have completely rejected it based upon thought and a thorugh study of the Bible. 95% of catholic doctrine is in direct contradiction to what the Bible teaches. I agree that most people’s version of God is too small. John, your statements are flat out wrong. It’s one thing for you to rationalize why you left (because you got raped by a priest), it’s another thing to say that 95% of Catholic doctrine is contrary to what the Bible teaches. The truth is that all Protestant sects take away from the fullness of the one Church Jesus created. Protestantism is all about subtracting from the Catholic faith.